We’d love your help. Let us know what’s wrong with this preview of A Falling Friend by Sue Featherstone. Coming spring 2016: A Falling Friend by Sue Featherstone and Susan Pape, a tale of two friends - one who always seems to make the wrong choices, and the other who's always there to catch her. After spending her twenties sailing the globe, making love on fine white sand, and thinking only of today, Teri Meyer returns to Yorkshire, England, —and to studying. That's when she d Coming spring 2016: A Falling Friend by Sue Featherstone and Susan Pape, a tale of two friends - one who always seems to make the wrong choices, and the other who's always there to catch her. After spending her twenties sailing the globe, making love on fine white sand, and thinking only of today, Teri Meyer returns to Yorkshire, England, —and to studying. That's when she discovers John Wilmot, the second Earl of Rochester, and poet of all things depraved. What she doesn't realise is even beyond his grave, his influence over her is extraordinary. To hell with the consequences. To ask other readers questions about A Falling Friend, please sign up. This review has been hidden because it contains spoilers. To view it, click here. What a fantastic debut fiction novel! I loved the characters especially Declan and Lee. I really enjoyed the development of Teri's and Lee's characters over the course of the book. The novel itself was very easy to relate to as were certain aspects of the characters. I was sad the book ended, it had me gripped from the start. Declan's hilarious 'chance my arm' attitude with the ladies, Lee is the friend we all need and poor, poor Victoria. Teri is hilarious, you can't help but enjoy her rants, e What a fantastic debut fiction novel! I loved the characters especially Declan and Lee. I really enjoyed the development of Teri's and Lee's characters over the course of the book. The novel itself was very easy to relate to as were certain aspects of the characters. I was sad the book ended, it had me gripped from the start. Declan's hilarious 'chance my arm' attitude with the ladies, Lee is the friend we all need and poor, poor Victoria. Teri is hilarious, you can't help but enjoy her rants, especially those about her stepdaughter. I couldn't help but feel sorry for Teri by the end. She just needs to be loved and cared for very badly! We meet friends Teri Meyer and Lee Harper. Both with very different personalities, Teri has been globe trotting for the past few years and arrives back in Yorkshire. The friends re connect when Lee gets Teri a job at the university she is teaching at. Lee is always the one helping Teri out of a pickle as she is more thoughtful, quiet and kind. Where as Teri is selfish, spoilt and annoying. We follow them through some trials and tribulations including work, men and step daughters and we learn very quickly that the dynamics in their friendship have changed and things are not quiet the same as they used to be. I began to like and appreciate both of the girls by the end. This has a great array of supporting charactors aswell. This story is told from both Teri and Lee’s perspectives, although a slow start as I wasnt into all the in’s and out’s of an admin office and found those parts pointless but I really got in to the story after and it kept me interested enough to see where it went. And what a cliff hanger it was. A Falling Friend is a story told in alternating chapters between two friends, Teri and Lee. Teri and Lee are quite opposite in personalties. Teri is definitely the more selfish one and I think she forgets that everything doesn’t revolve around her. She expects everyone to drop everything at the drop of a hat for her and overall expects a lot more than she really should. Though both women have their issues, especially in the love department, I did at times wish I could bang their heads together. Th A Falling Friend is a story told in alternating chapters between two friends, Teri and Lee. Though both women have their issues, especially in the love department, I did at times wish I could bang their heads together. They seemed to be quite immature when it comes to the matter of love. Not sure whether it’s a good or bad thing though that I think a lot of women will actually relate to the pair. They did remind me of myself when I was younger, though luckily I think I am more mature than that now. Or maybe thats just wishful thinking! I did find the story slightly slow to start with but as I got more into it I started to enjoy the trials and tribulations of what life was throwing at both ladies and it turned into an enjoyable and at times humorous read. Very glad to see that there is another book on it’s way. And people say MY book ended on a cliff-hanger. I've got nothing on A Falling Friend's ending. So, I'm assuming there will be a sequel. At least, I hope there is because the story is utterly incomplete! I adored Lee, despite her horrible taste in friends and woeful habit of putting up with the worst behavior from said friends. She is a sweet, natural character. Not perfect, but real. Someone you'd want to have coffee (or a weak Earl Grey tea) with. Now Teri. Oh, Teri, Teri, Teri. Well, she's a h And people say MY book ended on a cliff-hanger. I've got nothing on A Falling Friend's ending. So, I'm assuming there will be a sequel. At least, I hope there is because the story is utterly incomplete! Wow! Fantastic debut novel. Characterisation fantastic I feel like I deeply know these girls. Loved the authenticity of the setting. Lovesick anxiety portrayed really well, loved the girls despite their flaws, can't wait for the next one! I was lucky enough to win this e-book on a giveaway run by Lakewater Press. Here is my honest review. This is about two friends Teri and Lee, they are lecturers in a Yorkshire University. The story alternates chapter by chapter between the two women. One is described as slim and good-looking, the other a bedraggled charity shop user. They have been friends for many years. The story begins with them at an event run at the university. As the story develops we get a glimpse into each of their worlds I was lucky enough to win this e-book on a giveaway run by Lakewater Press. Here is my honest review. This is about two friends Teri and Lee, they are lecturers in a Yorkshire University. The story alternates chapter by chapter between the two women. One is described as slim and good-looking, the other a bedraggled charity shop user. They have been friends for many years. The story begins with them at an event run at the university. As the story develops we get a glimpse into each of their worlds, they are support for each other, share thoughts, dreams and future aspirations. Their childhoods are described and show a big difference in the way their parents raised them. As the story unfolds it becomes obvious that the two women we met at the beginning are not the same two we see at the end. They have each had to go through various personnal and professional issues, leaving them very different people. I enjoyed this tale of female friendship between two colleagues, Lee and Teri, with all its ups and downs; largely Teri’s ‘downs’, but with the endlessly patient Lee there to pick her up. A debut novel for these two writers, it was witty and pacey and full of well- drawn characters. The authors clearly write with experience of the environments in which they set the story: the media, and higher education, and this is an interesting backdrop to the tale. 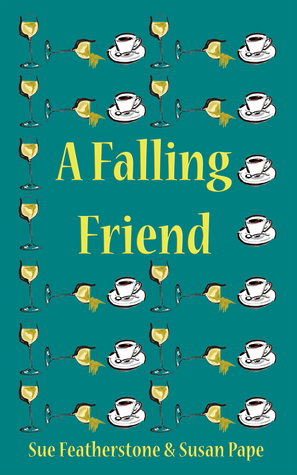 I thought ‘A Falling Friend’ cleverly writt I enjoyed this tale of female friendship between two colleagues, Lee and Teri, with all its ups and downs; largely Teri’s ‘downs’, but with the endlessly patient Lee there to pick her up. I thought ‘A Falling Friend’ cleverly written. There is sometimes a tendency to dismiss novels about female friendship as ‘frothy’, however this was spare in its prose and funny with it, but there was an element of poignancy along the way. The stream of consciousness story-telling of Lee and Teri’s rollercoaster love lives, with chapters narrated from both perspectives, made me think of a Jackie magazine-type comic strip for grown up women, dealing as it does with the characters’ angst- ridden anxieties as they navigate their lives. Much as I increasingly disliked Teri during the course of the novel, I did feel there was a glimmer of hope for her towards the end, with a dawning realisation of the effects of her own actions on others – and herself. I just loved the ending. Looking forward to the sequel which I hope is in the pipeline! I want to start by saying that in this book this is abortion, eating disorders and alcoholism. It has a lot of dry honor which I appreciated, this book reminded me of Sophie Kinsella’s writing. Best friends that are super jealous of each other. To honest I wish that some topics mentioned in here weren’t taken so lightly. My rating for this book is a 3 out 5 stars. I was given a copy of this book in exchange for an honest, voluntarily review. People tell stories. We always have and always will. It is as natural as breathing. In ‘A Fallen Friend’ Featherstone and Pape tackle an interesting question about the way we tell the stories of our lives. Don’t worry, they haven’t produced a how-to guide for writing your autobiography although I’m sure someone, somewhere will have done if you need a little shove in that direction. Rather they have taken a look at the way we sanitise and interpret events; the way we weave together a narrative, f People tell stories. We always have and always will. It is as natural as breathing. In ‘A Fallen Friend’ Featherstone and Pape tackle an interesting question about the way we tell the stories of our lives. Don’t worry, they haven’t produced a how-to guide for writing your autobiography although I’m sure someone, somewhere will have done if you need a little shove in that direction. Rather they have taken a look at the way we sanitise and interpret events; the way we weave together a narrative, for ourselves and others that are generally grounded in truth but is palatable to our view of the world. They pick up the notion of there being several sides to every story and intricately weave together the personal narratives of the two main characters Teri and Lee to demonstrate how disparate those perspectives can be. Chapters are written in the first person but switch between the two narrators. At first, I was a little disappointed by the characters; I felt they conformed to obnoxious, rich girl and Catholic, good girl stereotypes but as the novel progressed, I realised my stereotypical preconceptions were being challenged. Of course, the narrative gives us the action but we also learn what each character is thinking and what they hold back as well as what they say. Essentially we learn what drives each character which sometimes fitted with my expectations and sometimes surprised me. Misunderstanding and interpretation add depth to what is essentially a simple story about life and because the reader is party to both perspectives, they too can get in on the act…That isn’t what happened but I understand why you don’t want to admit it…. That isn’t her favourite wine but I see your heart is in the right place… She’s right but you’re not going to listen, are you? I found myself in conversation with the characters and, even when I didn’t agree with their thoughts and actions, felt I understood them which is a testament to the skill of the writers. In A Falling Friend, Teri Meyer returns to Yorkshire after spending several years sailing the globe, thinking only of “carpe diem”. Now she’s gone back to studying, and her friend Lee Harper has set her up with a job at the university where she teaches. But Lee fears that Teri’s actions will lead to some dire consequences, but since Teri isn’t the type of person who would heed a warning, Lee can only stand by and watch while her friend’s life spirals toward disaster. I really enjoyed the British humor throughout this book. I love it when I can tell when a book is set in Britain, or when it’s set in the States just by the way the characters speak and behave, and I could do that here. Teri is an intriguing character, but I liked Lee more. The both of them go through a lot of character development during the course of the book, and by the end, they’re vastly different from the people they were at the start. Teri isn’t a very likeable person, but as a character in a book, she was interesting. Although I often wondered how Lee could put up with her. I did enjoy her obsession with the Earl of Rochester – this was a nice touch that made her more intriguing. For the first 16% the synopsis reads better than the story...... and I almost stopped reading this book! Luckily, I persevered and I was pleasantly surprised. The storyline is realistic, although too girly and romantic for me, and deep dives into a friendship which is narrated from both perspectives. I must admit, when I got a review copy I wasn't overly impressed with the cover, and it took me a while to get into at first, but I did finish the book, and I am glad I did. It was an enjoyable tale of two friends, and the characterisations were complex enough to keep you reading. Will there be a sequel? I hope so! Teri and Lee are long time friends, teaching at a small University in England. Teri is almost a caricature of the selfish, lazy, mean friend while Lee is the thoughtful, sweet one. Teri's escapades cause issues for Lee, and their friendship is threatened by a series of Teri's missteps. Fun for true Anglophiles. A Great Fun Book about two friends going through some times in their lives where they need to make tough decisions. Told in different view points kept me reading. I really enjoyed reading this book since it kept my attention the whole time and I can't wait to read more of their books. I was given a copy through Lakewater Press to read and review if I chose to do so. I was not compensated in any way for this review. Teri and Lee has been friends for a long time, despite the fact that they are opposite. Teri is always up to trouble and Lee is always helping her out. Can her friendship survive through time even with work, men, money and family mixed in between? One of these friends is definitely "falling". I knew it going in. For a while I was certain she deserved it, but I couldn't turn away. By the time the fall was happening, I actually felt really bad for her. And now I must wait for book 2...and I will be waiting. A beautiful, touching, humorous and well-written story. I look forward to seeing what else this talented new author will deliver. A Falling Friend by Sue Featherstone and Susan Pape has got to be in my top five best books I have read this year. From the first page to the last, I loved it! The two characters, Terri and Lee are believable the story amazing and the ending? Well let’s not even go there! All I can say is I am eagerly awaiting the sequel – which I am told is in the making. The story is told through two best friends, Terri and Lee and you follow them through their trials and tribulations. Terri and Lee have been frie A Falling Friend by Sue Featherstone and Susan Pape has got to be in my top five best books I have read this year. Terri and Lee have been friends since school. Terri was the confident, spoilt and indulged popular girl and partly as a result of this confidence she felt superior over everybody including her best friend Lee. Lee was the quieter and steadier girl who would be there for Terri. Lee would listen to all of Terri’s woes and troubles but rarely receive from Terri the same return in return. Lee was always there for Terri and would defend her when no one else would. The start of the book finds the two women in a college where they are working as lecturers and we follow them through their trials and tribulations. You soon learn that the dynamics of their friendship have changed very little but that is set to change over the course of this book. Each chapter is an entry from a character and this really added to the feel of Terri’s and Lee’s relationship. Like any friendship there are always two sides to every story and this is made very clear with the style and layout of the book. I have to say that whilst reading this book I probably related far more to Lee; I was always the quieter and reserved person. I would be the one my friends confided in and I would defend my friends to the hilt. However there was a little bit of Terri in me, but that person never got to be seen or heard. I may have related more to Lee, but I still liked and ultimately felt sorry for Terri. Terri reminded me of a swan; elegant to look at, but underneath frantically trying to stay afloat. Terri was probably the loneliest and unhappy of the two but would never admit it. I honestly cannot find a negative thing to say about this book; I loved the style, the narrative, the characters and feel of it. There was romance, heartbreak and humour; which caused me to chuckle away to myself for some time. I did not want this story to end. It had me captivated from the very start and to prevent myself from reading it too quickly I would stop after a few chapters – and anybody who loves reading will know how difficult that is. I said at the start this would be in my top five of best books read this year and I stand by that. This book was reminiscent of the Bridget Jones Diary books and whilst reading it, it gave me that same happy feeling as they do. I said I could find no negatives; well I may have told a little white lie! There is going to be too long a wait until its sequel!! Another feature of the writing was that every paragraph is densely packed with ideas – descriptions, jokes, references – and this made it impossible to skim. I can certify that I read every word of the book; I had no choice. Because each paragraph and page is so densely packed with ideas, one is forced to concentrate intently. This does not, however, slow down the reading; to the contrary, the reading goes very fast and this may be partly due to the very smooth editing. The sentences just tumbled out – one after another. There were no hang-ups – instances where one had to go back and puzzle out what the authors were trying to convey. Once I returned to the book, I zipped through sixty or so chapters (some of them are quite short) in just a couple of days. We Americans are always amazed at how congenitally polite the British are. Some of the situations presented in “A Falling Friend” would have engendered much coarser language and perhaps more violent reactions had the book been written by an American. One wonders what the authors have in mind for the sequel. Higher stakes, more tension, more chaos…one can only hope. They certainly have the language skills to pull it off. Looking forward. Teri and Lee have been friends for many years. After Teri returns home from her globe trotting, Lee helps in securing Teri a job at the university where she teaches. Teri has always been particularly self absorbed, and Lee realises that even with time away Teri hasn’t changed one bit, and realisation dawns that things are not going to go well for her friend. This is a story of everyday life between two friends, the loyal and helpful Lee and the selfish Teri. What brings this story to life is the Teri and Lee have been friends for many years. After Teri returns home from her globe trotting, Lee helps in securing Teri a job at the university where she teaches. Teri has always been particularly self absorbed, and Lee realises that even with time away Teri hasn’t changed one bit, and realisation dawns that things are not going to go well for her friend. This is a story of everyday life between two friends, the loyal and helpful Lee and the selfish Teri. What brings this story to life is the fantastic supporting characters, they allow both Teri and Lee’s diverse qualities to stand out. When events happens in Lee’s life she needs Teri’s help, and in a truly remarkable moment Teri actually shows a different side to her egotistical nature, and that it is within her reach to be a true supportive friend. The majority of this book is told from both Teri’s and Lee’s points of view, from a position of manly having conservations between themselves and the difference of opinion that they both have. From the start I will admit that Teri really, really irritated me. I couldn’t get past how badly she treated her best friend. Then very briefly I found myself rooting for her not to ruin things. At a couple of stages towards the end of the book she gained some insight into her life. But then towards the end once again she became either clueless or in denial. I am not sure that this is the sort of book that I would normally go for, but the title hooked me and I wanted to know more. Having read it the title really does fit the story. There were points in the book when I was cringing at some of the things Teri did. However toward the end of the book I found myself smiling or having a little laugh along with her, and the more I read, the more I wanted to know how it would turned out for their friendship. Maybe I would have found the book funnier if I had not been so irritated by Teri. If You like a reasonably easy read with leading female characters give this a try. I received an advanced reader copy of A Falling Friend, despite the fact I was warned it "might not be my cup of tea". I have to admit that for the first third of the book, I struggled a bit with the language (slang) and references, but there was something about the characters Lee and Teri that kept me going. For me, the story started to pick up and I crushed the last half of the book flying to and from Las Vegas. Even from a guy's point of view, we all know a down to Earth Lee and we all know a I received an advanced reader copy of A Falling Friend, despite the fact I was warned it "might not be my cup of tea". I have to admit that for the first third of the book, I struggled a bit with the language (slang) and references, but there was something about the characters Lee and Teri that kept me going. For me, the story started to pick up and I crushed the last half of the book flying to and from Las Vegas. This was a nice enough book. I must admit that I nearly gave up early on when I found myself bombarded with information about the inner workings of a university admin office. I was glad I persevered however, as the story was amusing and the two lead characters were well put together, with sufficient depth that you felt like you really knew them by the end. Teri, as many other reviewers have pointed out, is a nightmare, and not the kind of person you'd want as a friend! However, her character mad This was a nice enough book. I must admit that I nearly gave up early on when I found myself bombarded with information about the inner workings of a university admin office. I was glad I persevered however, as the story was amusing and the two lead characters were well put together, with sufficient depth that you felt like you really knew them by the end. Teri, as many other reviewers have pointed out, is a nightmare, and not the kind of person you'd want as a friend! However, her character made for some funny reading matter. I'd say this would be a good beach read, if, like me, you've had your fill of psychological thrillers and feel like reading something lighter for a change. This book is definitely intriguing, I couldn't tear myself away for most of the story. One character (Teri) is a complete train wreck...the falling friend. The other friend is (Lee Harper - love that name! )...well, honestly a better friend than Teri deserves. Even though I liked it, I felt it moved way to fast without nearly enough development. And without giving it away, the ending fell flat. There was all this momentum and then...done! There's two sides to every story and in this case, Teri and Lee each have an opinion! This is well written, entertaining, and often worthy of a chuckle. The alternating points of view make it easier to see the shades of gray and remind you how easy it is to judge. Thanks to netgalley for the ARC- you will like this if you are looking for a conversation between two friends.